After transferring his capital to Delhi from Agra in 1638 Shah Jahan commenced the construction of Shahjahanabad, and a little later, on the 16th April 1639, he also laid the foundation of his citadel, Lal-Qila (Lal-Qal'a) or Red Fort, known also by other names in contemporary accounts. It was completed after nine years on the 16th April 1648. The entire fort is said to have cost about one crore of rupees, half of it on the palaces. 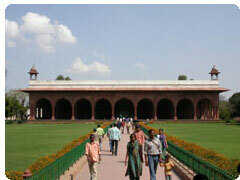 The Red Fort, so called because of the red colour of the stone largely used in it, is octagonal on plan, with two longer sides on the east and west. On the north a bridge with Salimgarh connects the fort. It measures about 900m by 550m, with its rampart walls covering a perimeter of 2.41-km and rising to a height of 33.5m on the town side and 18m along the river. Outside the ramparts runs a moat, originally connected with the river. The places lie along the eastern side of the fort, while two imposing three-storeyed main gateways flanked by semi-octagonal towers and consisting of several apartments are located in the centre of the western and southern sides and are known as the Lahori and Delhi Gates respectively. On the outside, the Delhi Gate is flanked by the statues of two elephants renewed in 1903 by Lord Curzon in place of the ones, which had been demolished long ago by Aurangzeb. 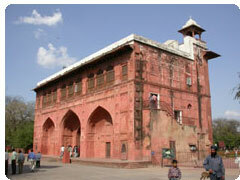 The main entrance to the fort lies through the Lahori Gate and the palaces are reached through a roofed passage, flanked by arcaded apartments called "Chhatta-Chowk" and now used as shops. The other portions were originally occupied by the residences of the courtiers and the retinue. Both the gates were provided later by 'barbicans' by Aurangzeb. There exist three other entrances on other sides, now largely closed. The master builders of the Red fort were Hamid and Ahmad, while the construction was supervised by other officers, who were amply rewarded by the emperor by appointing them to high positions. Most of the buildings in the fort were once occupied by the British army and bear scars of vandalistic acts inflicted on them. Quite a number of the structures were in bad state and were removed after the Mutiny. The Naubat or 'Naqqar-Khana' (drum house) stands at the entrance of the palace area, and was used for playing music five times a day at propitious hours. It was also called "Hathipol", as visitors dismounted from their elephants (hathi) here. Faced with red stone, it is a large three-storeyed building, rectangular on plan. Carved designs on its red stone walls appear to have been originally painted with gold, while the interior was painted in other colours. Several layers of these paintings can be traced even now in the entrance chamber. The later Mughal kings Jahandar Shah (1712-13) and Farrukhsiyar (1713-19) are said to have been murdered in the Naubat-Khana. The War Memorial Museum is now housed in its upper storey. The emperor received the general public here and heard their complaints. A marble dais, inlaid with precious stones, stands below the throne and was used by the prime minister for receiving the complaints and petitions. At the back of the canopy the wall is faced with beautiful panels inlaid with multicoloured stones, representing flowers and birds. These panels are said to have been executed by Austin de Bordeaux, Florentine jeweller. In the central panel on the top is shown the Greek god Orpheus with his lute. The panels were much damaged and at one time removed to the Victoria and Albert Museum in London, but were restored in 1903 at the instance of Lord Curzon. There existed originally six main palaces along the river front, with the 'Nahr-i-Bihisht' (stream of paradise) flowing through them. 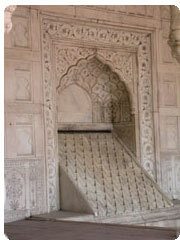 One of these to the north of the Mumtaz-Mahal, called 'Chhoti Baithak', has disappeared. 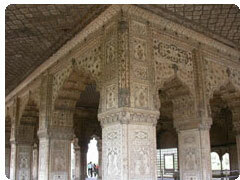 The Diwan-i-'Am (hall of public audience) is the next building reached by the visitor. Originally, it had a courtyard on its front. The hall proper, three bays in depth, originally ornamented with gilded stucco work and hung with heavy curtains, is raised on arches springing from pillars and has an impressive facade of nine openings of engrailed arches. 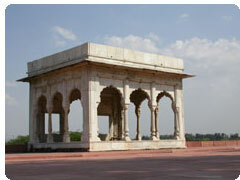 At its back stands a marble canopy or baldachin, covered by its 'Bengal' roof, under which stood the emperor's throne. 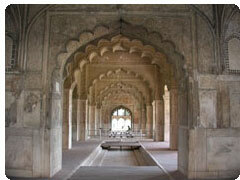 On the north of the Diwan-i-Khas lies the bathroom set or Hammam, consisting of three apartments separated by corridors. The floors and dados of these apartments are built with marble, inlaid with floral patterns of multicoloured stones. The two rooms on either side of the present entrance were used. It is believed, by the royal children for their bath. The eastern apartment, with three fountain basins, one of which is reputed to have emitted rose-water, was used mainly as the dressing room. There is a basin in the middle of the central room. The western apartment was used for hot or vapour bath, the heating arrangement being fixed in its western wall. To the west of the Hammam lies the small mosque, called the Moti-Masjid (pearl mosque), built by Aurangzeb for his personal use. The prayer-hall of the mosque is inlaid with outlines of 'musallas' (small carpets for prayers) in black marble, and it stands at a higher level than the courtyard. The hall is surmounted by three bulbous domes, originally copper-plated, which appear to be too constricted at the neck. The eastern door is provided with copper-plated leaves. The mosque was also used by the ladies of the seraglio. The area north of the Moti-Masjid is occupied by a garden, called the Hayat-Bakhsh-Bagh (life-bestowing garden), divided into squares on the pattern of Mughal gardens with causeways and channels between them. It finds mention in the contemporary accounts, althouth its present layout in new. At the north-eastern corner of the garden is a tower, called "Shah-Burj", now domeless, which suffered much during the Mutiny. A similar tower known as Asad-Burj stands on the south-eastern corner of the fort. The water for feeding the Nahr-i-Bihisht was apparently lifted up to the Shah-Burj from the river and then carried by channels to the various palaces. 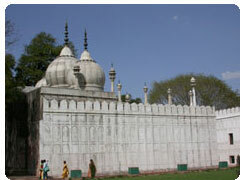 The present pavilion adjoining the tower on the south was perhaps built during Aurangzeb's reign. In the centre of the north wall is a marble cascade sloping into a 'scalloped' basin. Two other marble pavilions in the centre of the northern and southern sides of the garden are known as 'Sawan' and 'Bhadon', two principal months of the rainy season, either because they represent those months or were used during those months, but which one is Sawan and Bhadon is not exactly certain. The northern one is provided with a tank with niches for candles in its sides, so that the water cascading over them would create a picturesque effect. On the elevated strip of land along the eastern wall stood two small marble pavilions, built by Bahadur Shah II, the northern one known as Moti-Mahal and the southern one as Hira-Mahal. The former was removed after the Mutiny; the latter still stands. In the centre of the garden is a large tank with a red stone pavilion in its middle, originally connected by a causeway with the garden. It is known as Zafar-Mahal, after the Nom de Plume of Bahadur Shah II, by whom it was built, in about 1842. 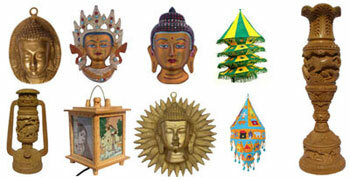 A "son et lumiere" is presented at the fort every evening, which recreates the magic of events related to the Indian history, particularly those connected with the Red Fort. The show starts after sunset and lasts for an hour. Photography / Videogrpahy: Still camera is allowed without any charge. Rs. 25/- is charged for movie camera.